The major role of liver glycogen is to supply glucose to the circulation maintaining the normal blood glucose level. In muscle and liver the accumulation and breakdown of glycogen are regulated by the reciprocal activities of glycogen phosphorylase and glycogen synthase. Glycogen phosphorylase catalyses the key step of glycogen degradation and its activity can be inhibited by glucose and its analogues. Obviously, any readily accessible inhibitor of glycogen phosphorylase can be used as a potential therapy of non-insulin-dependent or type 2 diabetes. Hepatic glycogen phosphorylase has been identified as a new target for drugs that control blood glucose concentration. In our experiments glucopyranosylidene-spirothiohydantoin (TH) was tested on the insulin sensitivity and blood glucose level of control and streptozotocin-treated rats. The streptozotocin-treated rats failed to gain weight and exhibited stable hyperglycemia (4.7 ± 0.5 mmol/L glucose in control vs. 7.8 ± 0.5 mmol/L) and low plasma insulin levels (9.6 ± 1.9 µIU/mL in control vs. 3.2 ± 2.2 µIU/mL). When insulin supplementation with slow-release implants (2 IU/day) was started 8 weeks after streptozotocin injection, blood glucose concentration remained suppressed, plasma insulin level dramatically increased and the insulin sensitivity restored. 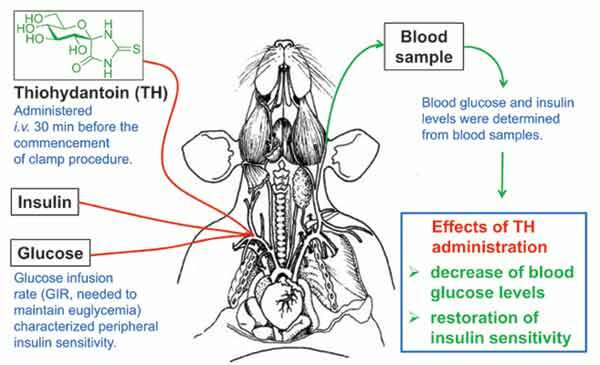 TH administration significantly reduced the high blood glucose concentration and restored the insulin sensitivity of STZtreated rats. Blood glucose, Glycogen phosphorylase inhibitor, Insulin implant, Streptozotocin, Type 2 diabetes. Dept of Pharmacology & Pharmacotherapy, University of Debrecen, H-4032, Debrecen, Pf. 12, Hungary.